Espress It Coffee Concept: a simple yet attractive shop-in-shop system, developed by Coffeeshop Company. This concept provides unmatched gastronomic excellence, based on best coffee and espresso quality as our core competence — from the farm into the cup. Espress It is a tailor-made concept for your gastronomic success and is characterized by the extremely high standards we set ourselves every day, inspired by lifestyle trends of fine fashion brands and visionary performance in automotive design. Experience this beverage based gastronomic concept in a simple yet convenient format: As a modular concept, Espress It is suitable for all types of locations. It can be integrated as a basic package, as a complete package or even as a free-standing cube module for self-service options in busy or high-frequency locations. 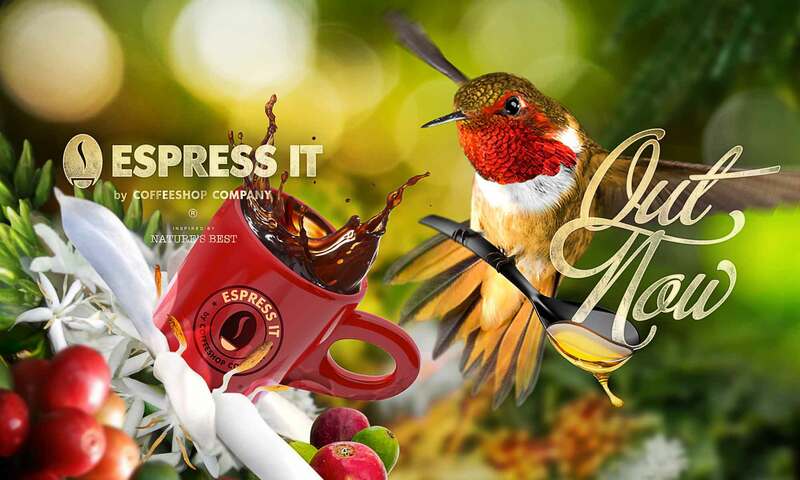 Espress It has been developed by the Coffeeshop Company as a trendy and cool coffee concept. It is a simple ‘start-up concept’ created by our family business and presents itself with a colour palette as a simplified version of Coffeeshop Company’s ‘Farm Story’. This vivid and flexible design with its strong visual appearance supports the authentic atmosphere of the farms from which our coffee originates. “Inspired by nature’s best“ — this guideline shapes our dynamic concept and its trendy visual appearance: Espress It stands for sustainability, essential design and aesthetics in tune with nature and represents the authentic atmosphere of the farms. Handpicked premium products are the core of our exciting concept portfolio. Compact and exclusive in design, our world-famous Schärf Xpress Vienna espresso machine with patented piston-cylinder technology guarantee maximum comfort with state-of-the-art technology of the highest quality. We owe the best quality coffee, from the first to the last step of the value chain, to this unprecedented combination. “Tradition meets modernity”: a design principle that reflects the Xpress Vienna in its perfection. This visionary piston-cylinder technology with its purely hydraulic-mechanical function is another USP of the Schärf Xpress Vienna espresso machine. The use of this piston technology also explains the very long service life and the intuitive maintainability of all our piston espresso machines. Some would say: It’s just a cup of coffee! But as experts and connoisseurs know, coffee is more than just a drink — it is more than just a stimulant, much more than that! Premium coffee is our passion. Every sip of our coffee stands for great emotions and untamed passion, which are a result of the efforts of countless committed and passionate people, through hundreds of processes. Enjoy the best and most sustainable coffee experience with over 800 flavors hiding inside every single coffee bean. Let yourself be guided through the fascinating world of our coffee specialties. From espresso and derived coffee delicacies, such as our world-famous Moccacino®, through traditional coffee specialties such as the Viennese Melange and tasty iced coffee variations to coffee smoothies – our coffee assortment offers an unforgettable treat! Espress It is not only the perfect fit for your gastronomic success but derives its structure through extremely high benchmarks that we have always set for ourselves. From excellence in the fashion industry to brilliance in the automobile industry, our standards have been set to help our customers feel the pulse! The pulse of our visions, our passion, our excellence and our commitment to our partners and our customers. In addition to the Espress It core package, special uniforms for men and women are available. Trendy & high quality garments round out the overall appearance of the coffee product, menu boards/cards and the hardware components. Discover the ESPRESS IT coffee concept. Click on the link below to start the download.